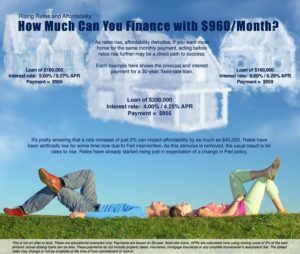 How Much Can You Finance with $960/Month? As rates rise, affordability dwindles. If you want more home for the same monthly payment, acting before mortgage rates rise further may be a direct path to success. Each example here shows the principal and interest payment for a 30-year, fixed-rate loan. 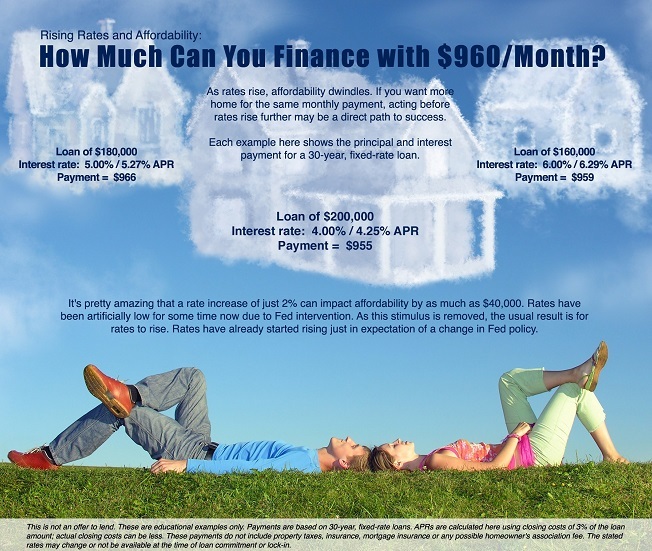 It’s pretty amazing that a rate increase of just 2% can impact affordability by as much as $40,000. Mortgage Rates have been artificially low for some time now due to Fed intervention. As this stimulus is removed, the usual result is for rates to rise. Home Loan Rates have already started rising just in expectation of a change in Fed policy.